Less than forty years after a savage civil war, this country is on the move. Tourists are discovering this beautiful land of green rice paddy fields, perfect beaches, soaring mountains, bustling, exciting cities, and people so friendly and welcoming you’ll be thinking of your next Vietnam family vacation soon after you arrive. From Hanoi, the capital where medieval and modern Asia meet, to the stunning hill country of Sapa, to spectacular Halong Bay, a family tour through Vietnam will take your breath away again and again. Hoi An is the region’s culinary capital and home to our fantastic cooking lessons, while the Mai Chau Valley is perfect for village to village hiking. Don’t forget Cambodia and Laos, both emerging as destinations in their own right. Cambodia’s incredible Angkor Wat, set deep in the jungle and where all you need to feel like Indiana Jones is a hat! And in Laos, don’t miss majestic Luang Prabang and memorable Mekong cruises in a land still virtually untouched by time. Take an overnight boat on the emerald waters of Halong Bay, dubbed the eighth natural wonder of the world. Kayak, swim, cave and take in spectacular vistas all around you. Spend some time in the capital, Hanoi. Wander the street markets of the Old Quarter, learn some history, taste the amazing food, and experience a city where old and new coexist. Take a trip up the Mekong Delta. Drift along narrow canals, visit floating markets, go to idyllic Phu Quoc Island and witness every facet of Vietnamese life. Visit the incredible Cu Chi tunnels used by the Viet Cong in the Vietnamese War and get a taste of what it felt like to be a soldier in the war. Or for a complete change of pace, visit Nha Trang and chill out on a glorious beach. See Angkor Wat, a sight equal to the Taj Mahal or Macchu Picchu, and feel like an explorer running wild in the jungle on a travel adventure. Go to World Heritage Luang Prabang, the fabled Laotian riverside town, full of historic temples, rich culture and set spectacularly against a majestic mountain backdrop. 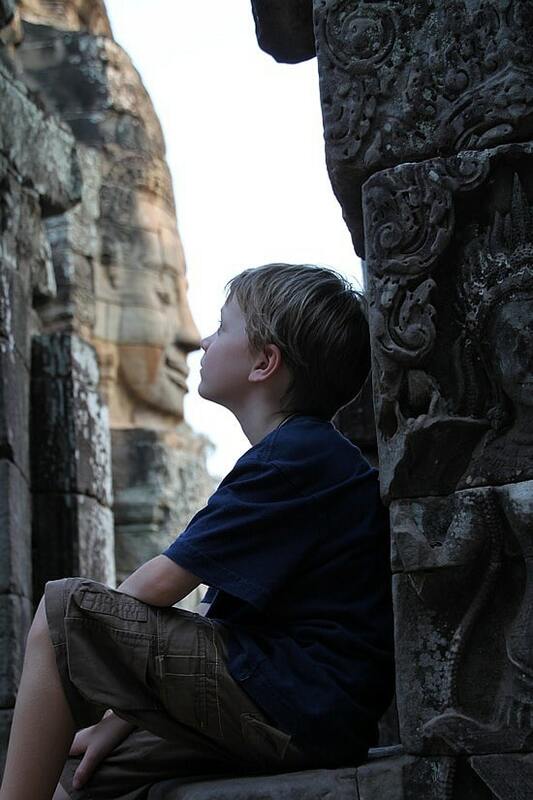 Cambodia with Kids: The incredible Angkor Wat.